We’d love your help. 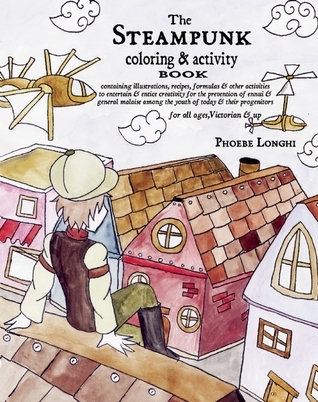 Let us know what’s wrong with this preview of The Steampunk Coloring and Activity Book by Phoebe Longhi. In a whimsical and elegant world powered by steam, where odd flying machines rule the skies and submersibles from Captain Nemo's wildest dreams explore the deep, this future that never was is ready for some color. Fun and games for all ages, Victorian and up. Phoebe Longhi enjoys making Victorian dresses when she's not drawing and painting, and resides in San Francisco, Cal In a whimsical and elegant world powered by steam, where odd flying machines rule the skies and submersibles from Captain Nemo's wildest dreams explore the deep, this future that never was is ready for some color. Fun and games for all ages, Victorian and up. Published April 30th 2012 by Manic D Press, Inc.
To ask other readers questions about The Steampunk Coloring and Activity Book, please sign up.